Our first No Ceilings show in London went down in October last year, and it was such a success that we decided to do another one. We’re heading back to Queen of Hoxton on February 10 with three awesome artists who are each set to have a big year. London via Adelaide producer/vocalist Count Counsellor will bring his sunny, soul-infused dance sound to the stage—check out “Disco Dodo” for an idea of just how much fun this is going to be—alongside Connie Constance and Sara Hartman. Constance impressed with the thoughtful, heartfelt songwriting on her debut EP, while Sara Hartman’s first ever song, “Monster Lead Me Home,” caught our attention immediately. 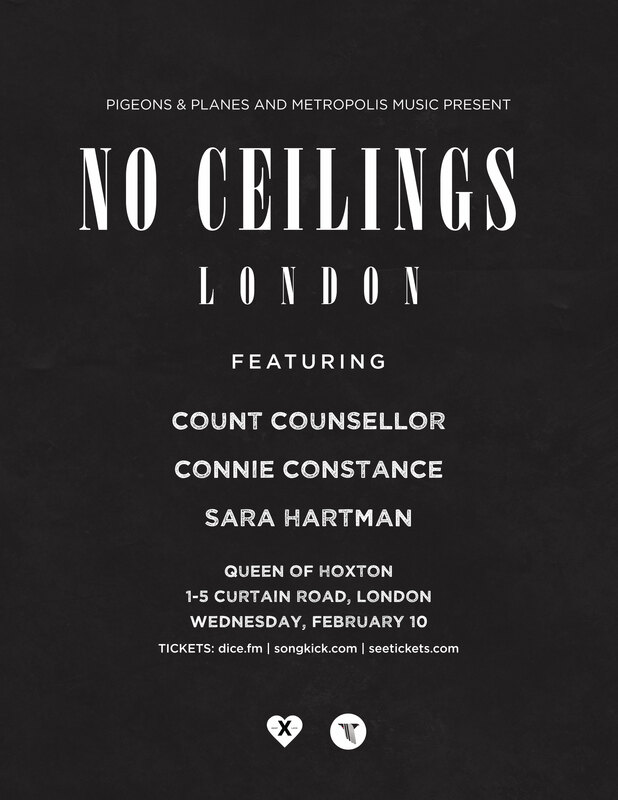 No Ceilings London goes down on February 10 at Queen of Hoxton. Check out music from the artists below and buy tickets here. Not in the UK? Want to hit a No Ceilings show? You’re in luck—we’ve got a show in New York with Cousin Stizz, Saba, and more on January 20. Details here.